Readers will think that turning something as practical as a closet into the topic for a design blog is hazardous. And, in some measure, it is. Yet, we have discovered that some closets are real examples of great design. 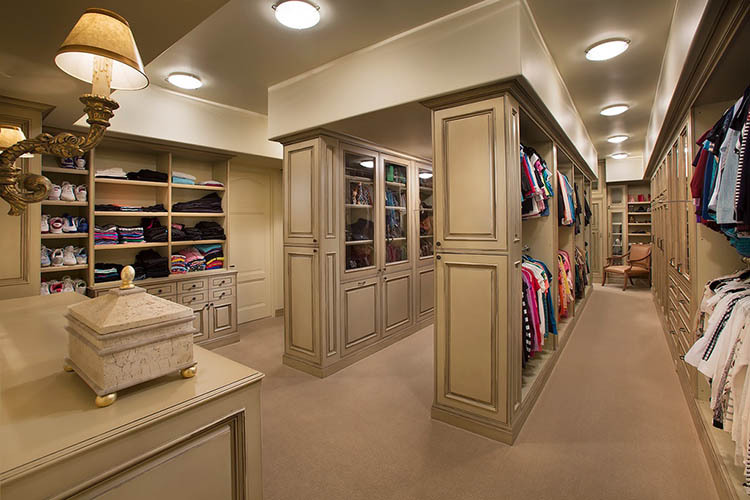 This is the reason why we have put together this gallery of 27 luxury closet ideas. Luxury closet designs seem to find inspiration especially from modernism and Japan. 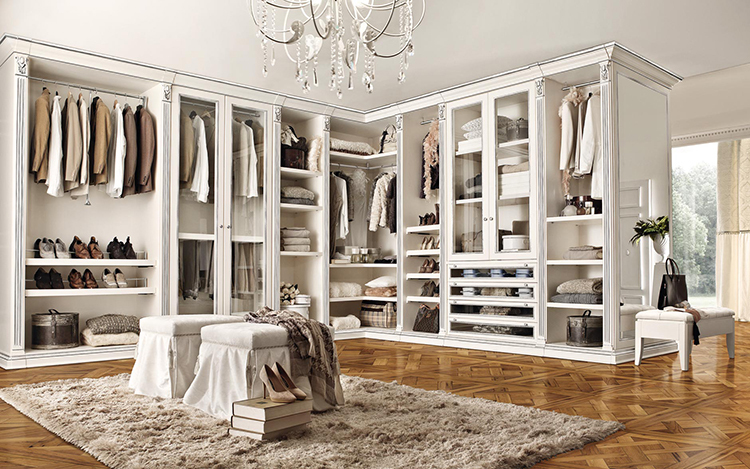 Naturally, there are still many fine examples of classical style closets; We have put some that are really beautiful. Now, imagine to walk in a closet looking around. You will be surprised by how different closet designs are from each other. 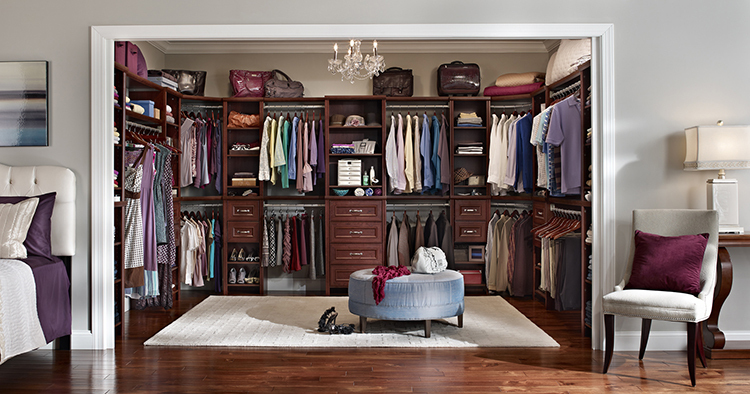 Luxury closets must be functional and practical. In this example, the racks on the sides provide a practical way to store sheets and jackets, while the small cabinets equipped with drawers set all around the room can contain the shoes and the underwear. Finally, the shelves over the racks offer a convenient place where to store any sort of boxes and hatboxes. The massive utilization of walnut wooden panels turns this luxury closet into an elegant space, something similar to a library. The double racks, the small built-in sideboard with drawers, and two layers of shelves provide you with all the necessary to store your clothes conveniently. Luxury closet designs often take some extra elements to embellish the composition, like in this fine example, where a Chinese amphora has been set in the mid. The practicality of the cabinet is then ensured by the two wardrobes on the sides, the small cabinet with drawers, and the usual clothe racks. The ornamental element in this fine wardrobe is a round sofa. This is more practical than Chinese amphorae, yet not less beautiful. Space optimization is great, as the two big wardrobes on the sides of the room are arranged in a way to store a huge collection of clothes. The palette with cream colours combined with classically decorated wooden panels gives a touch of posh elegance to this fine luxury closet design example. Notice the central corridor with two wardrobes utilized as side walls, which is a great way to optimize space. A good solution for a store or a shop design. Unusually placed in a triangular shape room, these closets show how an irregular space can be optimized and turned into a huge and practical wardrobe. The design exploits the walls with two long and big sideboards equipped with racks, drawers and shelves. Notice the two elegant shoe racks on the right side. 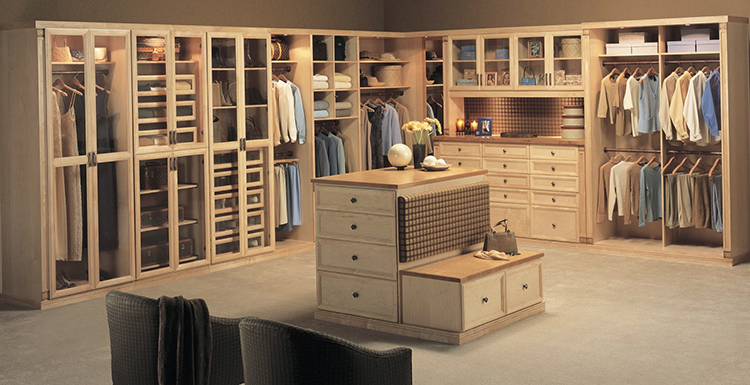 A classical wardrobe equipped with wall closets, shelves, a ladder and clothe racks. Here, the closet design uses the disposition of each individual element in order to create a sense of dynamism by breaking monotony. For this reason the elements are set in a slightly irregular way. The low bench in the middle adds further comfort. Another typical walnut wooden luxury closet with racks, drawers and shelves. What makes this design different is not only the smart disposition of the elements, but also the presence of some racks purposely designed for trousers and scarves. It is surely comfortable to walk through this spacious neoclassical style white luxury closet, where space is perfectly optimized and there isn’t stuff on the way. The practical island with cabinets and drawers in the middle provides extra storing volume. A great closet design idea for a shop or a store. A linear, yet elegant, simplicity makes the real difference between this luxury closet and similar luxury closet designs. Have a walk in closet and simply study this nice artefact. Everything has been arranged in a way that you have all your clothes and shoes at hand, without scarifying elegance to functionality. Differently from the closet designs that we have seen up to now, this wall closet takes up only one side of the chic combined space where it has been placed. 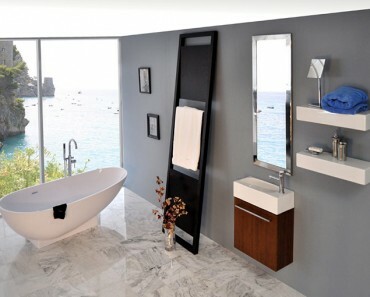 On the right side, we glimpse a luxurious bathroom through the opaque glass panels of the wall door. In front, a chair adds a note of comfort. 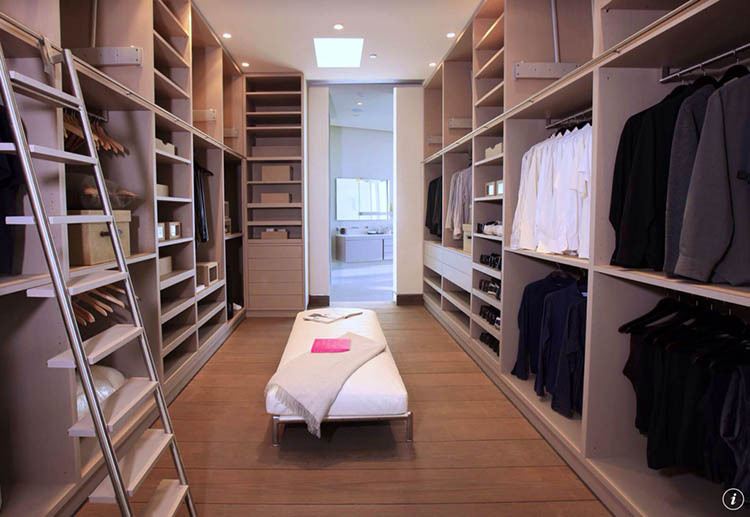 A walk in closet comes up like something very easy and natural in this smart example of modern luxury closet design, as space is optimized at the top here. Notice the rectangular floor window that casts light exactly on the comfortable low bench set in the middle of the room. 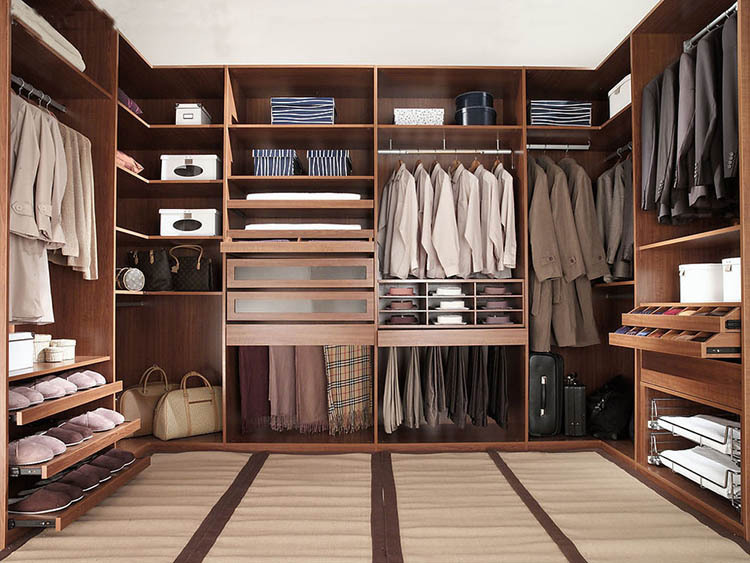 Dark walnut wood gives a note of seriousness to this fine luxury closet design. Imagine to have a walk in this closet and observe how everything is in perfect order, thanks to the great arrangement of its elements, from clothe racks to shelves. Notice the comfortable low bench in the middle, where it is possible to sit down and change shoes. 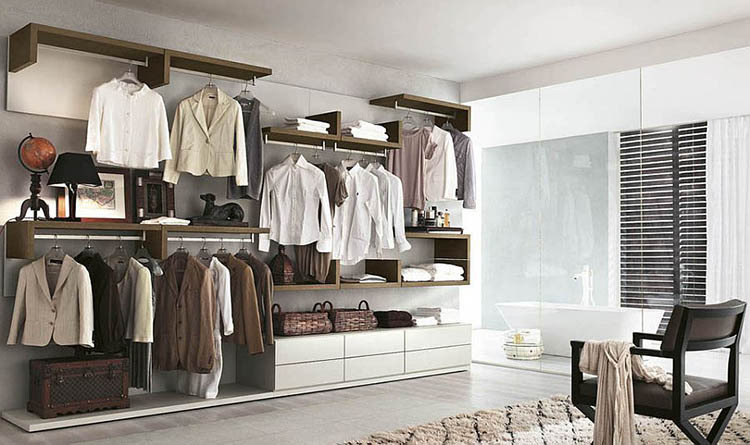 Another example of wall closet design very suitable for a combined space. The room in this example works as dressing, living and storage area. The design of the closet is modern and linear and glass panels are massively utilized, while a central island with cabinets and drawers adds a practical extra storage volume. 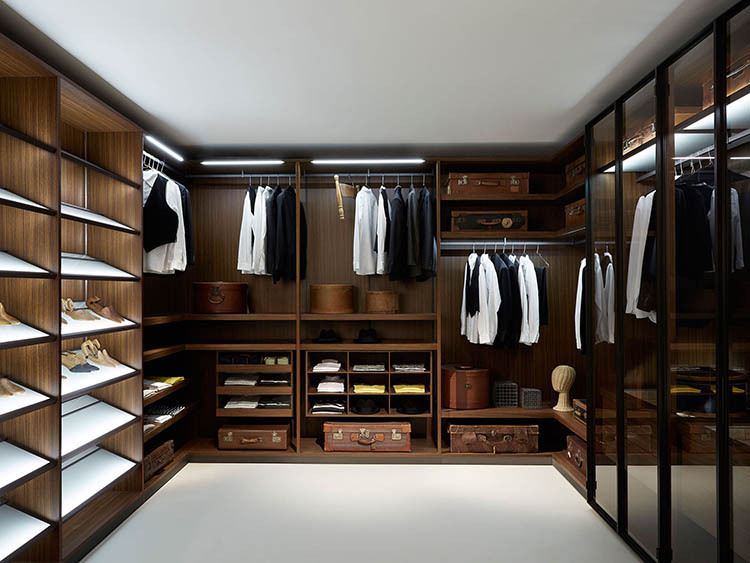 A walk in closet is definitively a great experience in this great design example. 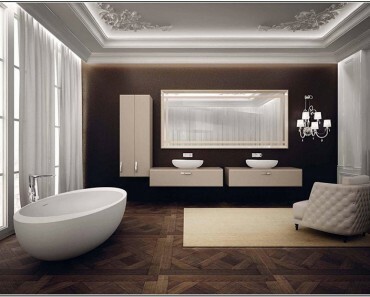 Observe the fine semi-circular dressing counter equipped with several cabinets and the posh marble floor. Shoes are placed in a wall shoe rack, while an island with drawers provides you with a practical place where to put shirts and underwear. 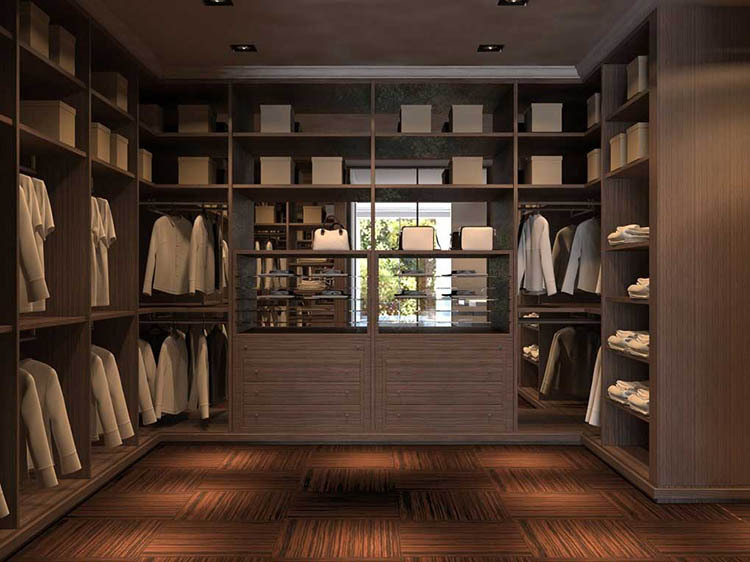 The repetition of two modules (the racks alternate with the cabinets with drawers on the lower level and the cabinets with shelves on the upper level) is used in this luxury closet design to improve its practicality, as in the closets of the past . Walnut wooden panels with classical decorations are utilized to embellish the design, while a touch of exquisite tastefulness is added by the graceful round low chair. Take a walk in this huge cabinet and enjoy the sophisticated atmosphere that only a modern design can generate. Decorations and ornaments are absent, in order to expose the bare beauty of the lines and the shapes. Modularity is never repetitive or boring, and wood is utilised in order to convey a sense of warmth and intimacy. Tradition and modernism meets to generate a really tasteful design in this fine example of luxury closet. Modularity is utilised, but the result is never boring or repetitive; the layout of the elements creates something practical, where everything is close at hand and easily detectable; finally, the utilisation of the white and the classical decorations make the closet look naturally elegant, yet not posh. Another classically-styled white closet design with wooden panels, arches, drawer cabinets, shoe and clothe racks, even an island in the mid. 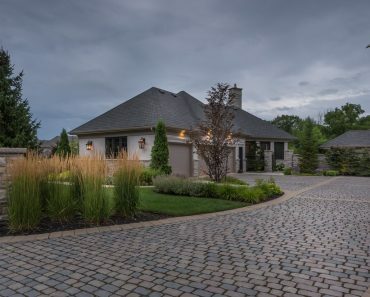 The difference with the previous design is that this one is placed inside a combined space, of which it utilizes a corner. This is a good example of space optimization that is quite common today. Shoe racks on the right, clothe racks and cabinets with drawers on the left. 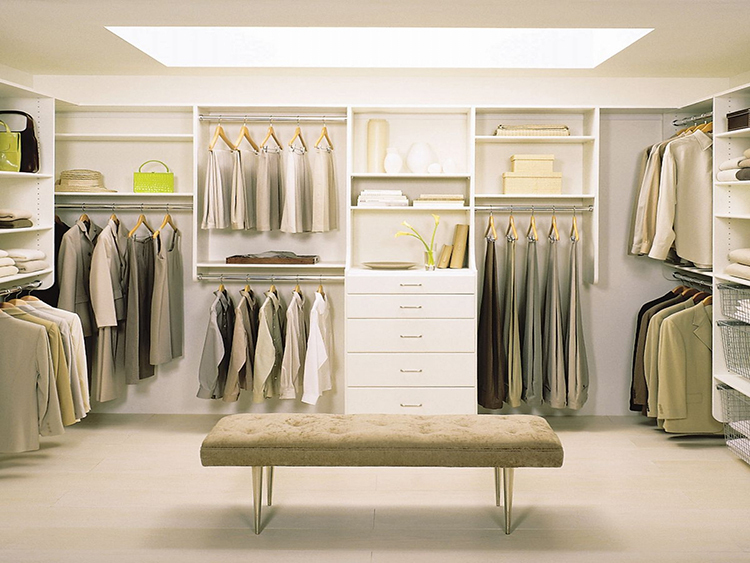 This is the simple, yet practical, layout of this modern closet. Notice the beautiful mirror with large frame on the foreground, that is the real focus of the whole composition. 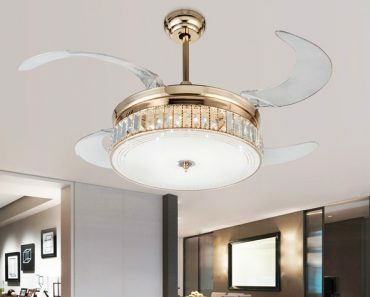 The fine chandelier with its unusual spiral shape and its palette of yellows, browns and black is what makes the difference with the other examples of classical white closet designs of our collection. The lucid surfaces give a posh touch to the whole composition and make this design perfect for a mansion or a luxury villa. 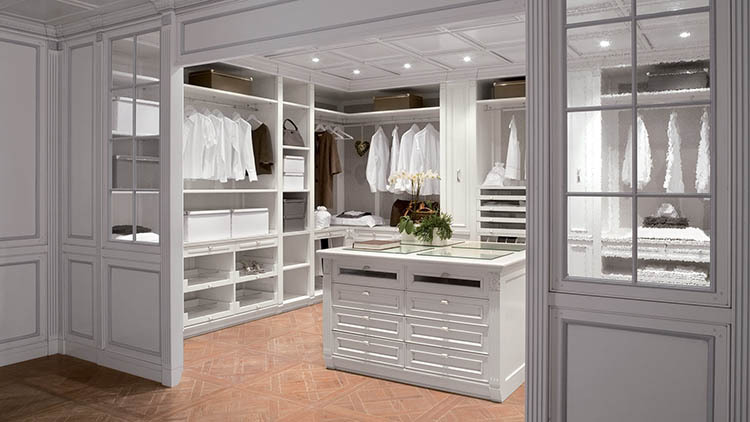 Have a walk in this luxurious white closet and notice how smart it is its layout. Space is greatly optimized, at the point that the corridor is turned into an efficient and functional room where it is possible to store almost everything, thanks to the huge availability of shoe and clothe racks, drawers, shelves and cabinets.